If you’re thinking of having a log burning stove, or a log burning fire, there’s never been a better time to take the plunge: after all, it can save you money at the same time as helping the environment. 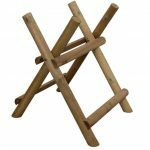 This large and tall log store is an ideal accompaniment for all those who use logs and firewood, and it provides real added value through the inclusion of a free and generously stocked firewood kit. Log stores fulfill two purposes in that they make it easy to store and retrieve timber, so that you’ll always know that you have a plentiful supply ready for your burner, and they should also keep the logs dry and in prime condition ready to be burned. This store carries out both these functions very well as its dimensions mean that it has a large log capacity, and the slatted roof and open front mean that there’s lots of ventilation to encourage the drying process. 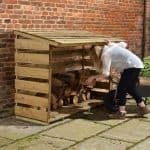 You might also like to see the top 20 firewood storage shed currently on sale in the UK by visiting the WhatShed firewood storage shed awards league table. The timber itself has all been pressure treated, which is something we really like to see, especially when, as in this case, it means that there’s a 15 year warranty period provided. It has to be screwed to a wall, but this gives it added stability and durability. We certainly found the design of this log store eye catching, as it features many traditional elements that we often see, such as an open frontage, timber cladding, and pent roof, and yet it’s taller and more imposing than most. The other striking feature about it, of course, is that it has no back. That’s because it’s designed to be affixed to a wall through the use of wall fixing screws and two battens. It’s easy to do, and all the fixtures and fittings are included. Once done, it gives the structure a lot more stability than commonly found on the log stores we review. Even though this is quite a shallow log store, the overall capacity is considerably greater than that offered by most of its rivals. This is thanks to its tall nature, as shown by the ridge height, at the back of the pent roof, of 1.95m and an eaves height of 1.61m; this in fact makes it taller than some garden sheds we review. Other dimensions to note are the overall width of 1.75m and the overall depth of 0.60m. HD WEFS cladding is used for both the wall and the two sides, but arranged in different ways. On the roof it is arranged in slats, creating the openings for the all important ventilation that logs to be used as fuel need, whereas on the sides it’s arranged in an overlap fashion. At just 10mm thick, we’ve seen a lot thicker cladding used on other log stores. On this occasion, however, the thickness of the cladding is less important than it is on other stores as here the stability is guaranteed by fixing the store to a wall. One way in which we think the store could have been improved is through the inclusion of a floor or base. As it is, an area of concrete, patio or paving will act as the floor, but these areas often have very high moisture contents that can leave the lowest tier of logs unusable or prone to rot. This log store offers more weather protection than most that we review, which in our increasingly damp and unpredictable climate is very useful. Whilst the roof is slatted, it is also pitched, so most rain or snow will be repelled or carried away. The solid and overlapping sides also keep rain coming from those directions out. The greatest weather defence of all, however, is provided by the wall to which the store is attached. Through careful positioning, for example by fixing it in an area covered by an overhanging roof, the owner can greatly down the exposure of the logs to rain while the open front will still allow the necessary ventilation. This means that the structure should be very durable. One other aid to durability is the pressure treatment that has been used on all the timbers. This is the feature we liked most about this log store, as it means that wood preserver gets into the heart of the structure, which makes it very resilient against the threat of rot. The effectiveness of this treatment is confirmed by the provision of a 15 year manufacturer’s warranty against rot, which is as long as any that we see on log stores or even on timber sheds. As with all wooden buildings and structures, we recommend that they are inspected annually and more wood preserver added where necessary. With relatively little timber involved on this occasion, this should be a simple and speedy process. It also makes sense to paint the timber, as otherwise it can rapidly fade to an unsightly silver or grey colour. 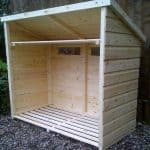 We’re always pleased to see customers given additional features for free, whether it’s with a log store, shed or workshop. 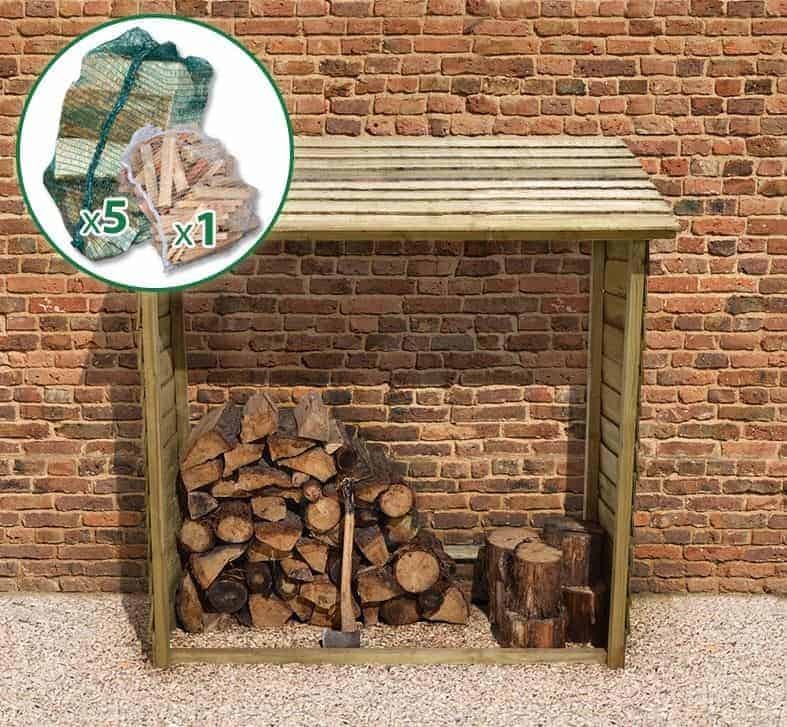 That’s why we think the inclusion of a firewood pack with this product is a great way to give added value. 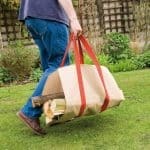 It’s surprising just how much is included, as there are five large bags of ready cut logs and another smaller bag of kindling. There may not be a lot of timber to this log store that has an open front and open back, but what there is is made to a high specification even if it could have been a little thicker. We feel a 15 year warranty against rot is a very generous gesture, and yet we can see this log store lasting even longer thanks to its initial pressure treatment. This isn’t a deep log store, and yet it’s both wide and tall so there’s room for a lot of timber to be kept inside. Even though there’s a requirement to screw this log store onto a wall it’s very easily achieved thanks to the straightforward instructions. Expect to take approximately two hours on the installation process. 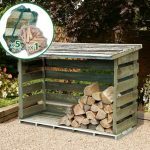 This is a long lasting log store, and it even comes with an initial supply of wood and kindling, so we feel it represents good value for money. 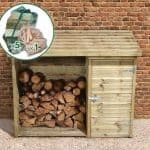 Final Thoughts: If you’re looking for a good value and well sized log store, then this is one of the best that we’ve seen. Some may see the fact that it has to be fixed onto a wall, rather than being freestanding, as a downside, but we like the way that this makes it feel very strong and stable and it can also give added protection from rain. The only real negative is the lack of a floor raised above ground level, but this can easily be constructed or installed. Once in place, you’ll have a long lasting store that will make the process of using logs as your fuel easier and more efficient.